Taking part in Skibbereen Theatre Society’s production of ‘Lovers at Versailles’ by Bernard Farrell, which will be staged in Skibbereen Town Hall this Friday, Saturday and Sunday and again the following weekend, are – from left – Kevin Cadogan, Carmel O’Driscoll, Mary O’Driscoll and Kieran Daly. Skibbereen Theatre Society’s Spring production, Lovers at Versailles by Bernard Farrell, opens at the Town Hall, Skibbereen, on Friday, February 10th. This year, the group has decided to take a year out from the drama festival circuit and concentrate on a ‘home’ production. Consequently, there will be just the one run of this laugh-a-minute comedy – so no second chance to see it after the drama festivals are over! Lovers at Versailles will run for six nights over two consecutive weekends Friday 10th, Saturday 11th and Sunday, February 12th, as well as Friday 17th, Saturday 18th and Sunday, February 19th. The play examines the plight of three women who are left behind when Stephen Sullivan dies. His wife, Clara, always suspected that Stephen had a hidden life. His daughter, Isobel, is determined to use every opportunity to move up the social ladder, and Anna, Stephen’s favourite daughter, is offered a second chance at happiness. Throw into the mix Farrell’s off-the-wall sense of humour, along with some unexpected twists and turns, and audiences should enjoy a great night’s fun. The cast has some regulars with quite a few new faces to the Skibbereen stage. Directed by Fachtna O’Driscoll, the lead roles are played by Sarah McCarthy, Mary O’Driscoll, Jason Moloney, Kieran Daly, Carmel O’Driscoll, Kevin Cadogan, Terri Kearney and Niamh Woods. There are quite a few ‘extras’ with some familiar and some not-so-familiar Skibbereen faces appearing throughout! The stage crew of Charlie Keohane, Gearoid MacEoin, Con Minihane and Fachtna Hamilton, under the watchful eye of technical director Barty Connolly, has come up with a few surprises for the audience. John Hegarty and Gearoid MacEoin have devised an imaginative lighting plot. Sound recording was by Sacha Puttnam and the sound system will be operated by Hilda Hegarty. Stage management is done by Sinead Cripps and Una Murray. 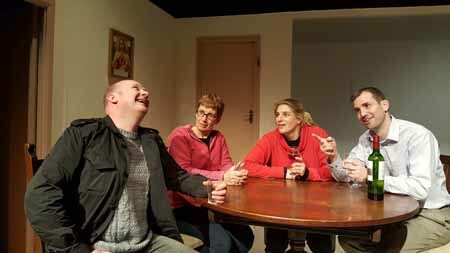 As usual, bookings are through Thornhills Electrical and sales are sure to be brisk for a play that is novel in structure and hilariously funny. * An upcoming production visiting Skibbereen Town Hall is The Successful TD, based on the writings of John B Keane and starring Mary McEvoy of Glenroe fame and Jon Kenny of D’Unbelievables, which will be playing there on Friday, March 10th next, for one night only. It is currently on stage at the Gaeity Theatre in Dublin to great reviews and advance booking is recommended for the forthcoming Skibbereen show.